Last night in the midst of a near panic attack because my blog post disappeared from my computer screen, (I’ll tell you about that in a sec) someone messaged me looking for the RhyPiBoMo Facebook page…they had been commenting on the Facebook EVENT page instead. I noticed several others had done the same thing but there were very few people checking those posts. SO…I decided to delete the EVENT page to eliminate confusion. The start date had passed so it didn’t occur to me that Facebook would send helpful emails notifying people that RhyPiBoMo had been cancelled. So much for making things less complicated! It is not a crisis of magnificent proportions but it was frustrating. I think everyone is still here…LOL Thanks for your patience! My earlier crisis was when I had 3/4 of the blog posted in the website and decided to go eat dinner. When I returned, the blog contents had disappeared completely. It’s a long story and technically ludicrous but…it was all still there…I just couldn’t see it! I hate cookies! I did manage with Google and WordPress support to find the ghost-like blog and continue posting on a different browser. Today someone asked a great question about contemporary cinquains and how they differ from traditional cinquains. It seems that a line was left out that explains it. Thanks for catching that! It’s complete now so you can look back and check out the differences. It’s actually pretty cool, and challenging! 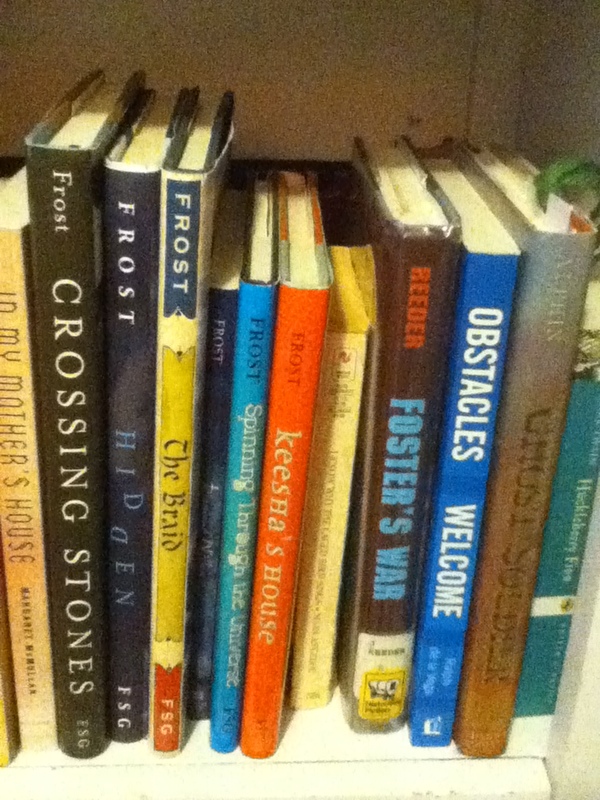 Thanks to Vivian Kirkfield for helping gather a list of the picture books we are reading this week. She is compiling a list from a Facebook post. 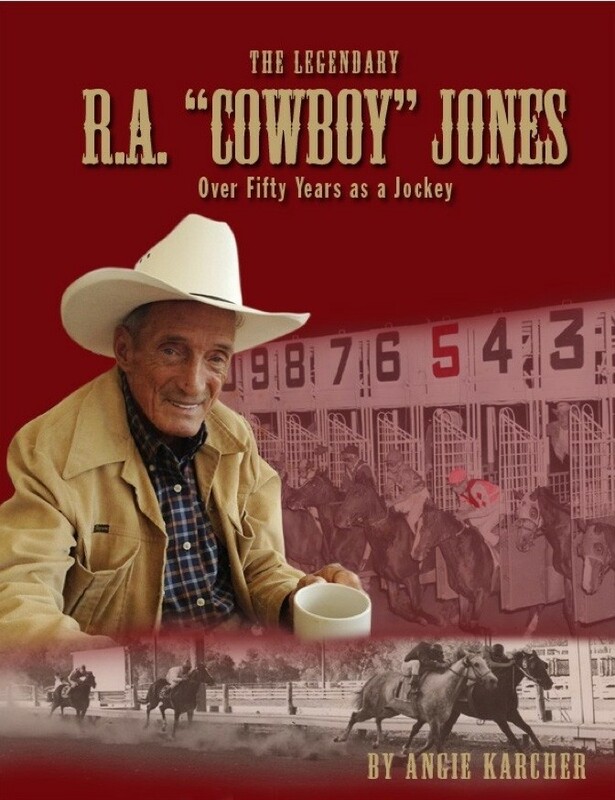 Please add the title and author’s first and last name so we can add them to a master of list…I wonder how many PBs we will read this month? that we are learning, I recommend reading every one of her books! across the page you’re trying to write. Don’t quit until you get it right. send it off and see what prize you’ve won. Please Do NOT attribute this “poem” to me. I wrote that in approximately two minutes. What could be easier, right? In each of those four stanzas I’ve done something wrong—at least one thing—how many can you identify? Take a few minutes to study that before reading on. Stanza one: Many beginning writers, even if they have a reasonably good ear for meter, add extraneous words to make the rhythm come out right. Look for “very” or “very, very” or unnecessary repetitions of words. Stanza two: Sometimes rhyme can lead you to a great metaphor or simile that you would never have found without it. This is not an example of that. A word is nothing like a little bird in this instance, and the comparison only serves to slow down the reader as they try to figure out how it might be apt. If you write something like this, and then figure out a way in which a word can be compared to a bird, go back and work on the poem until your metaphor or simile carries its meaning in a beautiful and seemingly effortless way (though of course it will not have been effortless). Stanza three: Rhyming homonyms will grate on most editors’ ears. 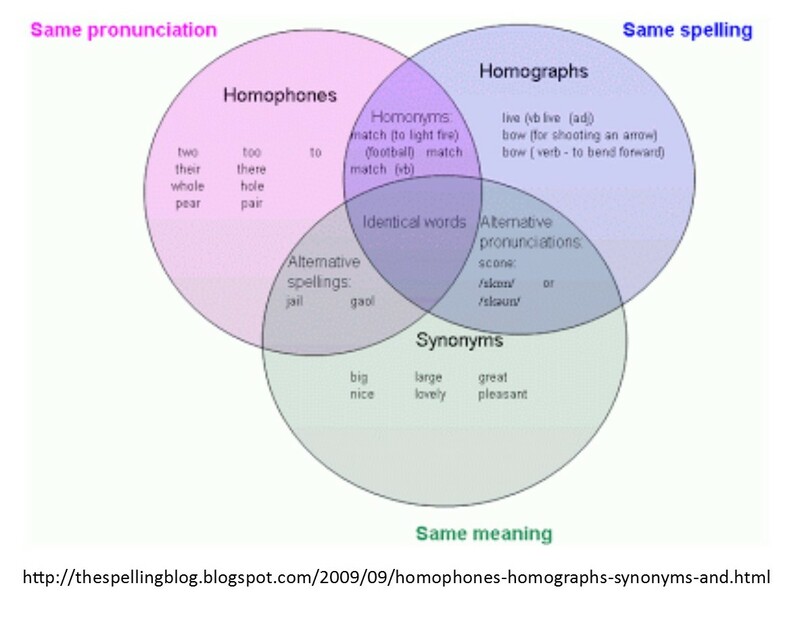 Apparently, there is a recent debate about the usage of homonym/homophone. Helen kindly sent me the link to this article to explain the discussion. Thanks Helen! Stanza four: Two things here, the first being a review of Stanza one. Would anyone actually include the word “that” if they were speaking this sentence? And: An almost-right metrical pattern is worse than no such pattern at all. Having said all this, there is a little nugget of good advice hidden within that bad writing. 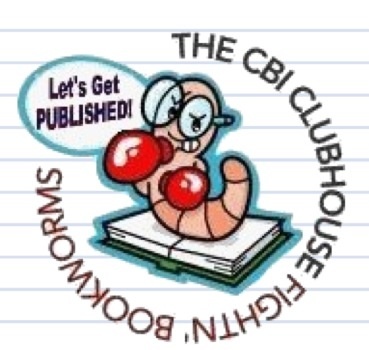 Do keep lookin for just the right words and images; don’t quit too soon; and when you’ve worked hard and written a poem that pleases you, send it off to a contest or to an editor. Let it offer it’s wisdom to the world, and may it bring joy back to you! Here’s a page from a notebook where I was working on Step Gently Out. 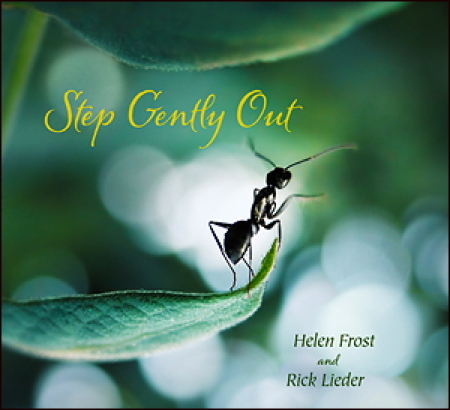 Helen Frost worked for about twenty years as a poet before publishing her first poetry collection, supporting herself with work she also loves, that of a teacher–in elementary schools, as a poet-in-the-schools, and at the college level. 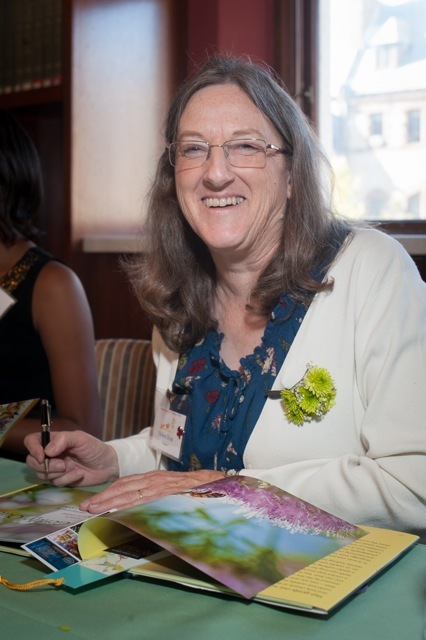 Her books include seven novels-in-poems for children and young adults, two collections of poetry for adults, two plays, a book about teaching young people to write about difficult issues, two picture books for younger readers, and two anthologies. 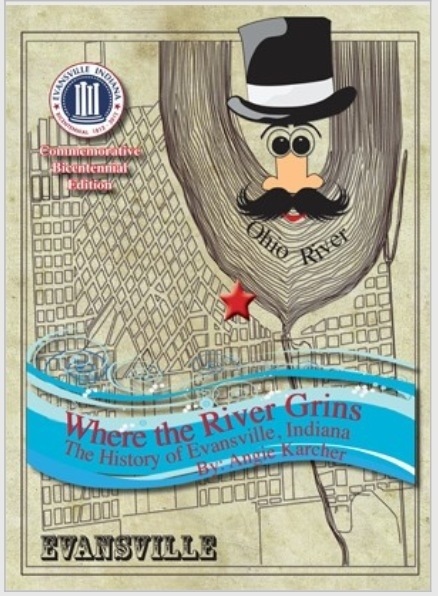 She continues her work with children and teens through school author visits, and is now a full-time writer, living in Fort Wayne, Indiana. After yesterday’s long lesson I thought we’d visit something a bit more familiar today. Haiku is probably one of the most recognized forms of poetry. 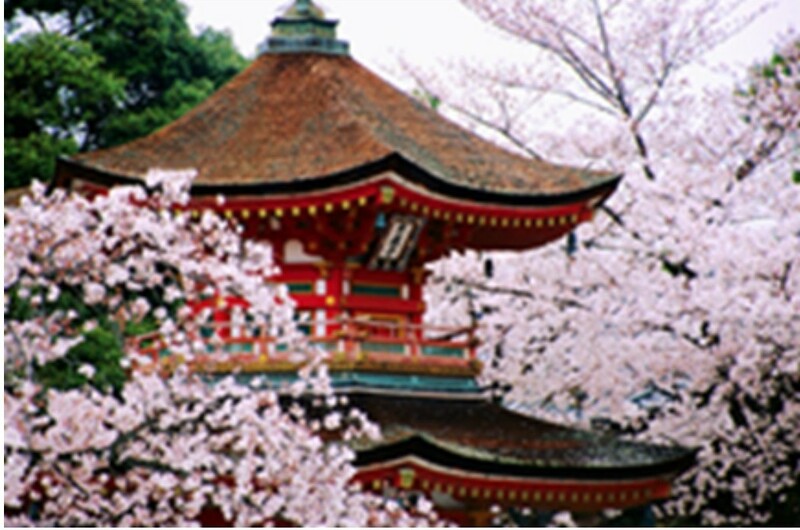 The Haiku form of poetry is hundreds of years old and was originated in Japan. Haiku has its own set of fairly strict rules. You need to know what a syllable is to write Haiku. Syllable – the slightest portion or amount of speech or writing, how many beats a word has. 1 It must be written about nature or refer to something to do with nature, for example, seasons or weather. 2 It must be written in the present tense form. 3 It should generate a picture in the reader’s mind about the subject. This is a different form of traditional poetry than cinquain but similar in the process. The more difficult form of Haiku has fewer words and more rules. This means every word must count! As picture book writers, we are familiar with this concept. We try to stay in a tight word count when writing a picture book…now you have to tell a story in 17 syllables. are plumes of pampas grass. I thought this was so funny! Limerick humor… plus I’m sleep deprived! A limerick is a short, humorous, nonsense poem. When I hear the word limerick, I immediately think of Ireland and leprechauns but Limericks were originated in England. Supposedly the name is derived from Limerick, Ireland where there was a popular pub song with the refrain “Will you come up to Limerick?” Apparently, many the drunkard knew this tune and it was passed down through the years. 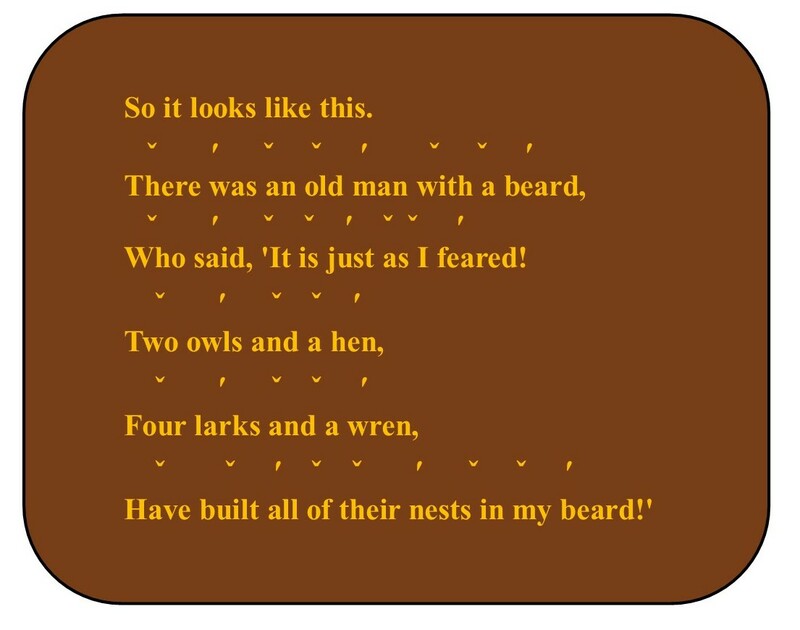 Limericks are, oddly enough, one of the earliest forms of poetry for children. 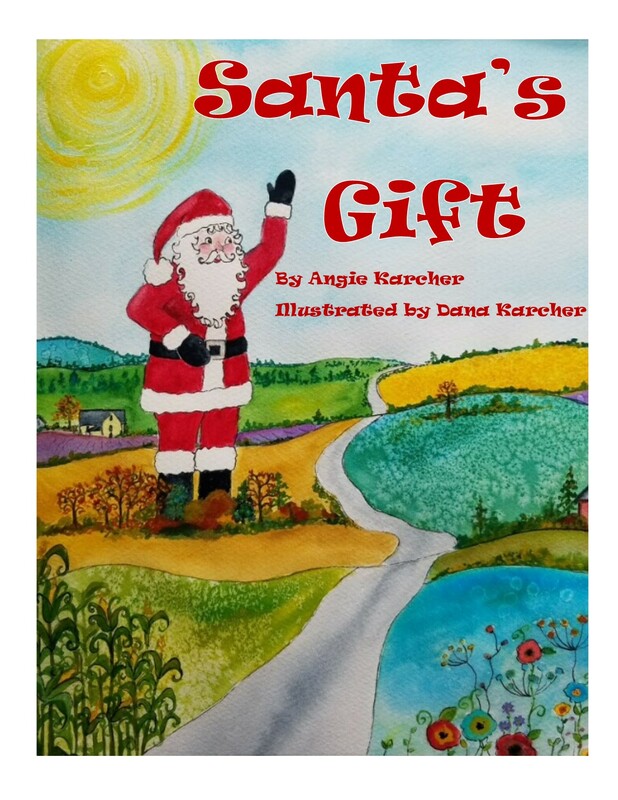 They are written with humor in mine and were a type of nursery rhyme and storytelling. The first line of a limerick traditionally introduces a person and a place, with the place appearing at the end of the first line and establishing the rhyme scheme for the second and fifth lines. In early limericks, the last line was often essentially a repeat of the first line, although this is no longer customary. Writing poetry is about following the rules of rhyme, rhythm and stressed and unstressed syllables. A limerick is a good example of rule following and begins us on our baby steps of learning the rules. DON’T LET ALL THE ODD NAMES OF THINGS INTIMIDATE YOU! Today, we are going to learn in depth about stressed and unstressed syllables, rhyme scheme, feet, meter, iamb and anapest. It’s not about remembering what they are called right now…it’s about understanding that each type of poem has a different rhythm and rhyming pattern. So for now, all we have to do is follow the rules! Keep a page in your notebook with definitions, rules, etc. so you can refer back if you need to. For the lesson today, we will also be doing MATH! Yes, math is the key to understanding metrical feet and its different patterns. If you can listen, count and track the stressed syllables, you will get this! Syllable – the slightest portion of a word or how many beats a word has. When you were learning to read, your teacher had you clap out the syllables of words to help you count how many beats there were in each word. This also helps you learn to listen to the word and its parts. When learning to write poetry, we study word sounds and their parts. We are talking about words with two or more syllables. Listen for the part of a word that has more emphasis, or stress on it, than the other part of the word. If you look in a dictionary the stressed part of the word is usually in boldface. When the stress is on the wrong syllable, the words sound very strange and awkward and it’s certainly not how we pronounce them. 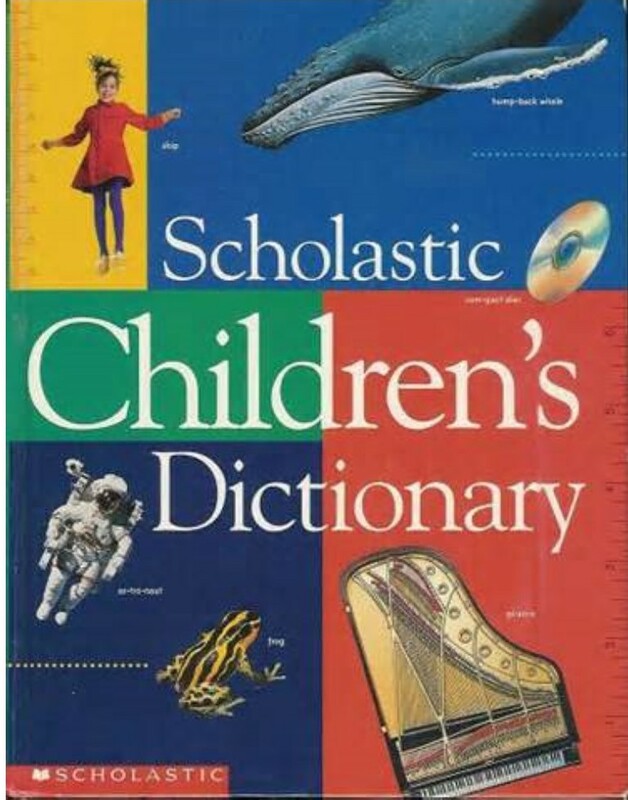 FYI – I sometimes refer to a Scholastic Children’s Dictionary as it is very basic and has minimal definition…it gets to the point and is simply written. It is also easy to find the stress of the word syllables if you are unsure. Writing Exercise: Make lists of 2, 3 and 4 syllable words and then highlight the stressed syllable in each word. Add at least 10 words to each list so you get very comfortable finding the stressed syllable. You could guess and then check to see if you are right with a dictionary. Earlier this week we learned about Rhyme Scheme. Well rhyme scheme is very specific with a limerick. The pattern of rhymes used in a poem, usually marked by letters to symbolize corresponding rhyming end words. The rhyme scheme for a limerick is AABBA. 1)A traditional limerick often starts out with, “There was once a…” but not always. As with any rule, there are exceptions which we will talk about in a minute. 2)The ending of the first line is usually the name of a place, town, or country. 3)A Limerick is a 5 lined poem. 4)Lines 1,2 & 5 rhyme with each other. 5)Lines 3 & 4 rhyme with each other. 6)The first, second and fifth lines should have eight or nine syllables. 7)The third and fourth lines should have five or six. 8)Lines 1, 2 & 5 have 3 feet. 9)Lines 3 & 4 have 2 feet. What? Feet? Don’t Panic! WE WILL TALK ABOUT FEET NOW! Remember, children write limericks so we can do this! Don’t shut down now and think this is too complicated! Think of it as a game or a puzzle. You have to take one rule at a time and make your words fit into those rules. It’s challenging and fun! This is where we listen for the stressed and unstressed syllables. Even a nonsense word like dadadum has a stressed syllable. If this was a line of poetry, it would have 3 metrical feet or 3 repeating patterns of sound. I’m not sure measurement is the best word to use…it’s really just a way to identify, or group together, certain patterns of stressed and unstressed syllables. Dum = the stressed part of the word…this part gets more emphasis when we say it. This particular metrical foot is called an Anapest. An anapest is the name for a type of foot. Now, let’s just say that we had all one syllable words in a line of poetry. One syllable words don’t have a stress. But…when they are put with other one syllable words the phrase has stressed words and unstressed words. Now, mix the line with one and 2 syllable words. Say it out loud so you hear the stressed word parts! A limerick has a certain “rhythm” created by how the syllables are stressed. Many limericks have an Anapaest meter but not always. 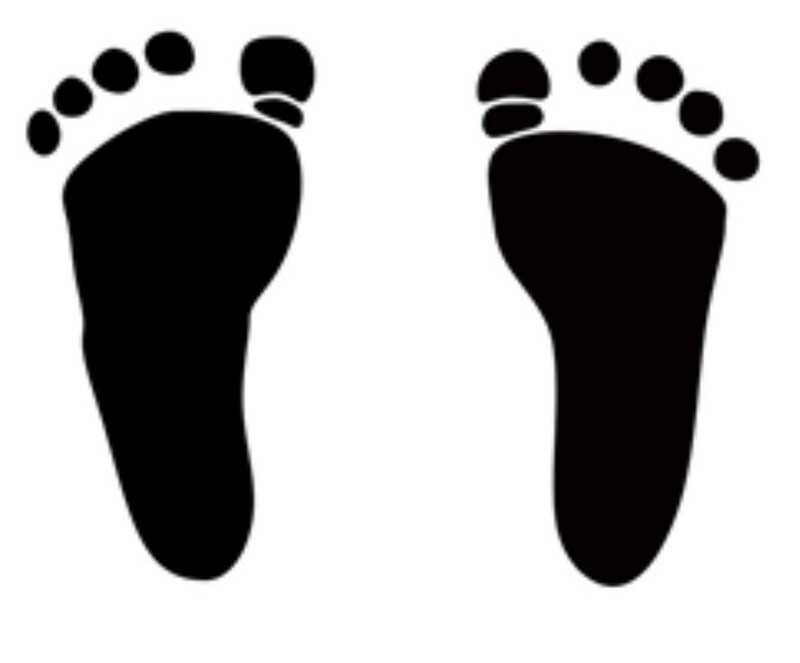 Please visit this site and read about metrical feet over and over until it makes sense. There are diagrams of feet and everything! Now that we know about feet, we are back to the rules of a limerick. □ 2)The ending of the first line is usually the name of a place, town, or country. □ 3)A Limerick is a 5 lined poem. □ 4)Lines 1,2 & 5 rhyme with each other. □ 5)Lines 3 & 4 rhyme with each other. □ 6)The first, second and fifth lines should have eight or nine syllables. □ 7)The third and fourth lines should have five or six. □ 8)Lines 1, 2 & 5 have 3 feet. □ 9)Lines 3 & 4 have 2 feet. Refer to the rules above with this nonsense poem and see if we have followed all the rules. Yes, by George, I think we’ve got it! 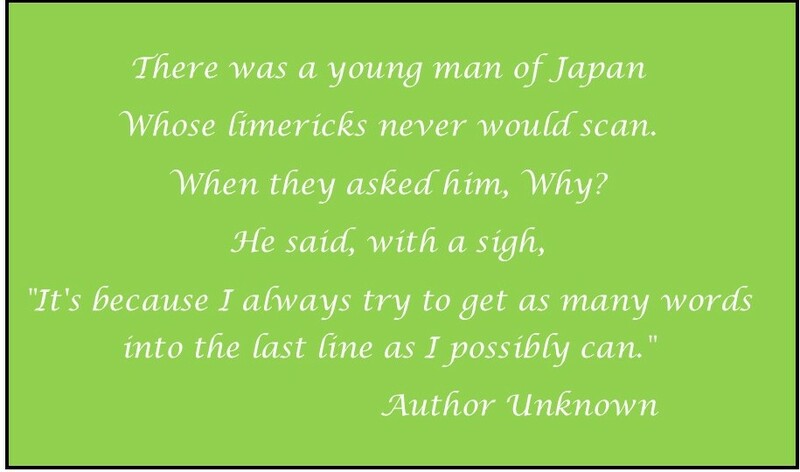 Here is an example of a traditional limerick with Anapest meter. One of the exceptions: Sometimes a limerick might start out, “There once was a…” and that’s a different foot all together. This type of metrical foot is an iamb. Here is a traditional limerick with 1 iam and 2 anapest feet. Re-turned on the pre-vi-ous night. And as for the buck-et, Nan-tuck-et. Up to this point, I have been signifying the stressed syllable with the color red. The proper way to signify an unstressed syllable is with the symbol ( ˇ ) and for a stressed syllable we use ( ʹ ) over each word. My favorite resource book for learning about poetry so far is titled POEM MAKING by Myra Cohn Livingston. There are other common metrical feet that we will cover later this month. They are: dactyl, spondee, trochee. Today’s post was briefer than yesterday’s but it was full of more meat and potatoes! This may be one of the most important lessons to understand as the foundation to learning rhythm, meter and scansion are hiding here. Go back and read everything out loud now…that will help! 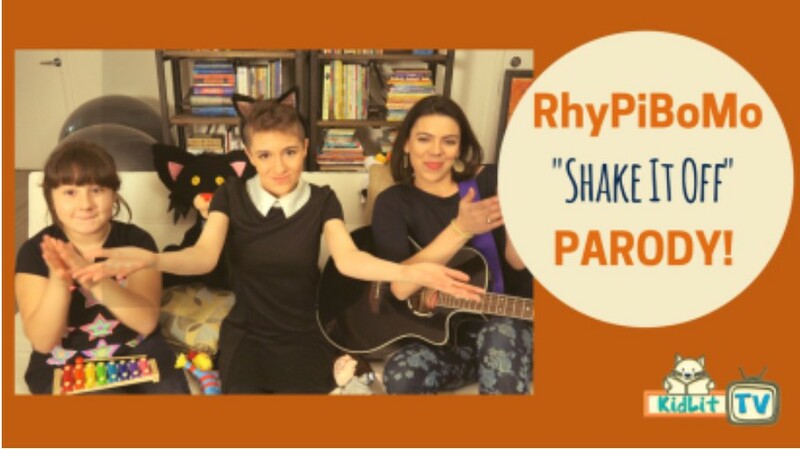 I hope this is making you thirsty for more rhyme and poetry! We should have a lemonade social at the end of April…by then we will be professionals at making lemonade from all these sour, lemony, poetry lessons. Don’t think that you have to get it all in one day. We will be revisiting most of what we learned again later in the month. Squeeze those lemons and add lots of sugar! Writing Prompt: Write a haiku and a limerick! And have fun! ← Have a RhyPiBoMo Wednesday! who wanted his own pet gorilla. so he settled on a chinchilla. Angie, I hope your technical difficulties leave you alone for the rest of April! I know we all appreciate how much time and energy you are putting into RhyPiBoMo. It’s a joy to participate. Helen’s analysis of the problems in the poem was very helpful; I’m guilty of using “that” as a filler word all too often! Beautiful haiku, Melanie! I can just see that triumphant crocus! I meant to also say thanks to Angie for mentioning Lane’s website – rhymeweaver.com. When I was making edits on my rhyming picture book last year, that site was invaluable. Thank you, Helen — it really helps to have your poem to demonstrate those dangers we need to watch for. And, Angie, I LOVE that link to RhymeWeaver about the explanation of different feet! Who got lost in a Swedish museum. And refused to go home. If you visit, say “Hi!” when you see him. Liam must have been honored! Love this one. Shorter post but more difficult content!!! I am struggling to come up with haikus and limericks but I am not going to give up. I just need a bit more of time. Off to work on them!!! Thanks for the post! I am learning a lot! Thanks! A lot of good information here. And thank you, Helen, for what to look out for. Not always easy to see the error of our ways. Thank you, Angie, for putting together such great lessons. We’re being challenged to step up to the plate. You have put so much into this- Thank You for your time and effort. Thanks, Angie! This is all so helpful. And I loved Helen’s advice. Good luck with the computer problems. What a headache! Thanks Angie, you have set forth a great challenge. Oh boy, I have much to learn. It’s interesting, but definitely challenging. I don’t think I’ll be posting my “poetry” attempts here today. Thank you Helen and Angie. Another good one. Thank you, Helen, for the blog about what not to do when writing a rhyming picture book. Oh wow. I have stumbled on a GOLDEN girl in you Angie. Thank you, thank you. Love these lessons and homework too. (I don’t even give my kids homework (homeschool). Now I have it. Hahaha. And thank you Helen. I appreciate all of this more than I could ever say. Thanks for all the info and all the great lessons. That was fun! There’s a running joke with some of my friends about how little I shave in the winter months, so here’s a limerick they’ll appreciate! Who oft’ let her legs get so hairy. It’s all got to go! Long fur on a girl is so scary. I’m still working on my limerick. Thanks for the exercises. Angie you rock! Thank you for all the work explaining things ! Thank you Helen. This is entirely too much fun! I am really enjoying how you’ve organized the information. It’s meaty, but I come back to this blog hungrier each day. What a treasure trove of fantastic information. Reading today’s blog, I felt like I was being let in on a secret. I thought all of this information was so interesting, relevant, and important, and written in a way that was digestible and easy to comprehend. Of course, I am going to need to reread it so I can internalize the information better, allowing it to become second nature for me. Thanks for a great post! Wow! There’s so much info in today’s post. I’m still trying to decipher it all! Another great post! Those extra little words . . . yes, I think I may be guilty of this. So much great information! Thanks so much! 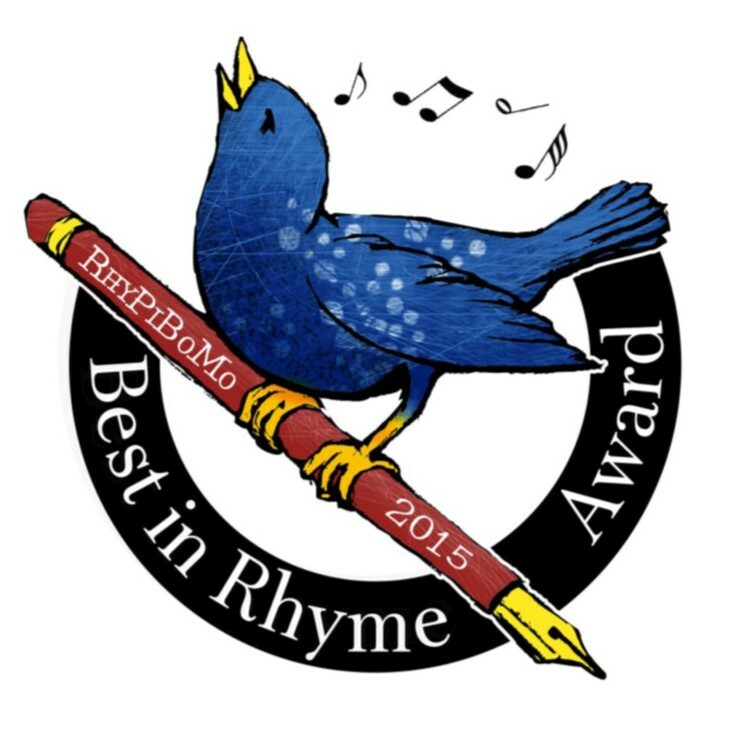 Helen thanks for the reminder on rhyme crimes! What a terrific post! Thank you. I never knew there was so much to Poetry. I can tell you are a teacher. You explained everything so precisely. Thanks! So much I didn’t know. So much I didn’t even know that I didn’t know. Thank you! Wow, thanks Helen and Angie– what a great lesson! 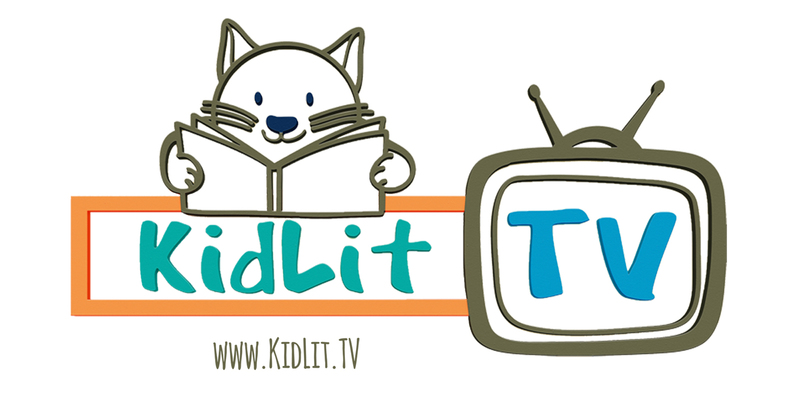 And for today’s pledge, I read “Don’t Slam that Door” written by Dori Chaconas and illustrated by Will Hillenbrand– and it’s all about the limerick! Good timing! Loved this post, and haikus and limericks are so fun and rewarding to write. I’m working to slowly catch up on these lessons! When I was a kid, I thought Limericks were the BEST! I am just catching up on the past several days and loved this lesson! It explained a couple of things I was unsure of! 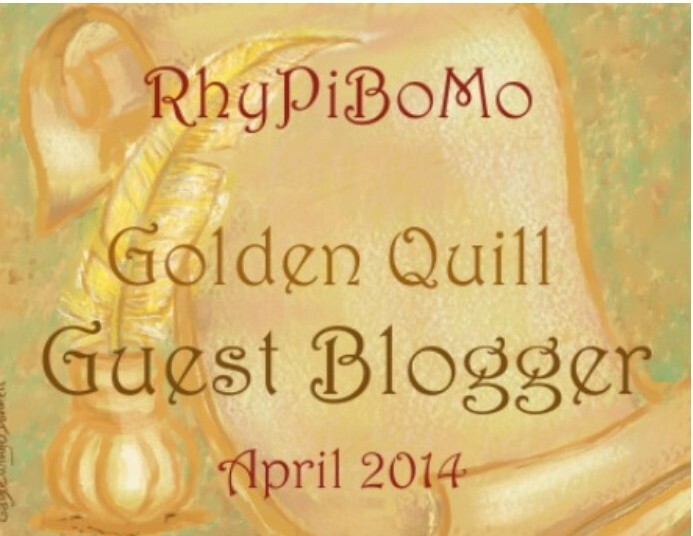 I loved this guest post! !